DENVER -- Would you like to see and smell a corpse this weekend? You'll be able to at the Denver Botanic Gardens for a brief period of time. A corpse flower bloomed Friday night at the Gardens, an official with the Gardens said early Saturday. 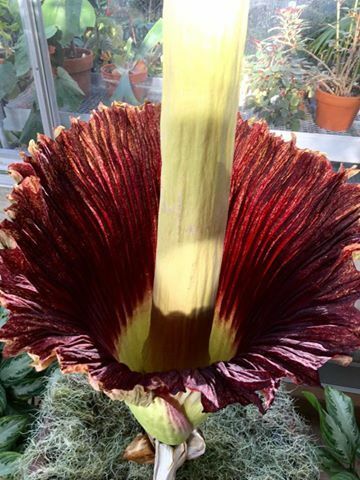 Named "Little Stinker," the second corpse flower to bloom in the history of the Botanic Gardens is seen as the little brother of "Stinky," which drew hundreds of visitors to the Gardens almost a year ago . The bloom only lasts 24 to 48 hours, "so today (Saturday) is best for viewing opportunity," a Gardens spokesperson said. The Denver Botanic Gardens will be open from 9 a.m. to 8 p.m. You can save $1 per ticket if you purchase your tickets online . Officials ask that you use the hashtag #LittleStinkerDBG if you're going to share photos on social media. The flower, Amorphophallus titanum, emits an odor that has been described as being like rotting flesh, garbage and an old gym bag. Viewing a corpse flower is a very rare event, as seven to 10 years can pass between each bloom. The corpse flower is native solely to western Sumatra, a large Indonesian island, where it grows in openings in rainforests on limestone hills, according to National Geographic .